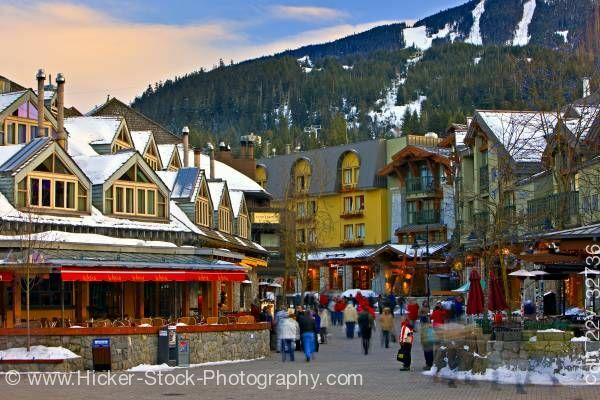 Stock photo of pedestrian activity and shops along the Village Stroll in Whistler Village, British Columbia, Canada. The tall rooftops are mostly snow covered as are the mountains in the background. This stock photo shows pedestrian activity and shops along along the Village Stroll in Whistler Village, British Columbia, Canada. Whistler Village is a year-round attraction. The village has everything, and after a day's leisure activities, visitors can stroll through the pedestrian-only streets and shop or browse at the wide variety of shops and specialty stores, boutiques and fine galleries. There are also variety of distinctive restaurants, cafes, lounges, and nightclubs with patios. During summer the village comes alive with clowns, musicians and presentations on the village streets. There is a strict building code, the large hotels are built in the chateau style and all buildings are built in quarried stone. This gives the overall impression that Whistler Village is much longer established, and lends to a European ambiance. The overall mood here is very relaxed and carefree, people are enjoying themselves and this is reflected in the atmosphere.